When I am traveling, I enjoy a cozy and intimate place with an authentic feel. 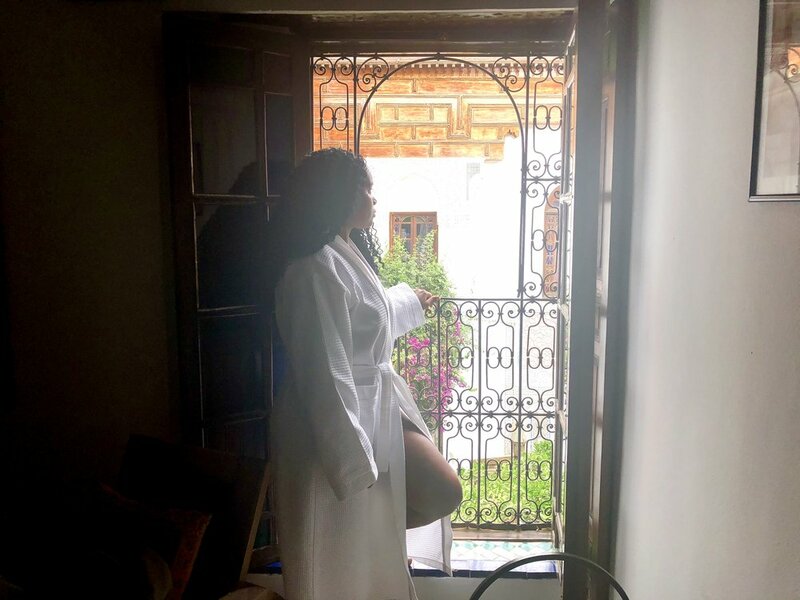 I’ve had my fair share of large resorts and although I enjoy those too, there is nothing like being welcomed at a small boutique hotel with a laid back vibe. What I also enjoy is a space that can provide me with a luxurious feel without causing too much pain to my wallet. So when I had the chance to visit the busy city of Fes, I was happy to have chosen Riad LaaRoussa for my stay. From the moment we arrived, there was something very homely and vibrant about this riad. I couldn’t help but stare at all of the intricate details from the floors, to the walls, to the accessories hanging around the courtyard. We were welcomed with drinks and refreshments that were much needed after a four hour train ride from Casablanca. The riad is operated by a family with beautiful children and family pets that roam around charming guests. The dogs are a bit larger than average but they are extremely friendly. The pets will kindly ask for food with their eyes and it’s okay to feed them. Don’t be alarmed by Paul the turtle either. The staff treats you like family and caters to your every need. 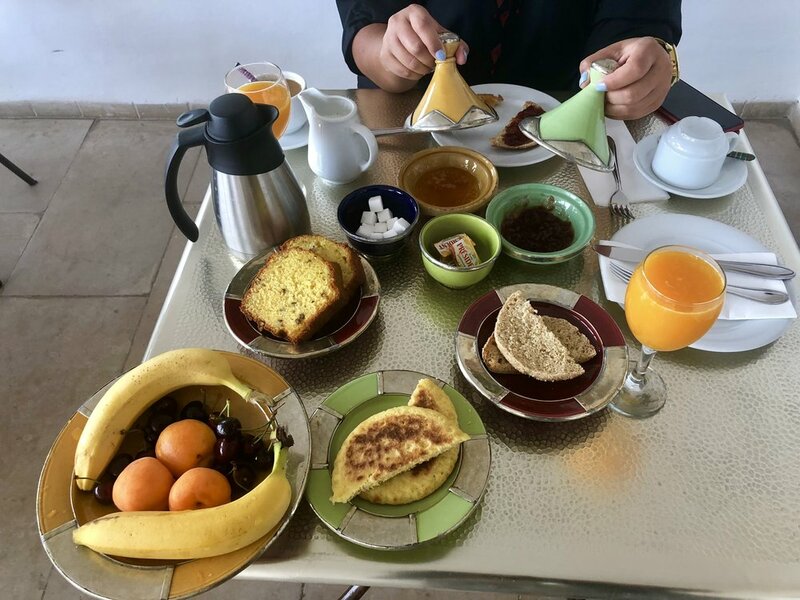 We had an early morning tour scheduled and the riad arranged a wonderful breakfast spread just before our departure. Although there were other guests staying here, it felt like we had the place to ourselves. It was so quiet and relaxing that it was hard to believe this place was right in the middle of the medina. A medina is an old walled part of a North African town. It’s full of all kinds of vendors trying to sell goods and sometimes it can get overwhelming. I try to make it a habit to squeeze in some relaxation while traveling. In the past I’ve gotten caught up wandering and capturing photos/footage that I end up skipping out on what most people do on vacation: relax. The pool was perfect place to just take a break. It’s a nice size and we had it to ourselves during the afternoon. I laid in the beach chairs, relaxed in the hammock, cooled off from the heat of Fez. Not too bad for a Friday afternoon if I say so myself. Just when I couldn’t get enough of this cozy place, what sold me at this riad were the bathroom products. I am very big on natural oils and creams for my skin. When I saw rose water on the bathroom sink I was shocked in the best way possible. I always bring my own bath products when I travel (soaps, oils, etc). So being that this riad had better products than what I brought with me, it made me feel even more at home because I’ve never seen any hotel with these products. To top it off, the soft robe and slippers added a great finishing touch. If you are on a budget but still enjoy a little luxury, I highly recommend you stay here. This riad will provide you with the perfect balance of luxury without breaking the bank. I was welcomed as a guest of Riad Laroussa but all opinions, words and photography are my own. The train is the easiest and most economical way to get to Fes. We arrived in Fes via train from Casablanca. The ride was just under four hours and I recommend purchasing a first class train ticket for just under $20. I found the most recent schedule here. Tickets aren’t sold online but the schedule gives you a good idea of the train times. Purchase your tickets at the station at least 30 minutes before departure. Trains typically don’t fill up so you should be fine. From the Fes station take a red taxi to the Medina and arrange for the riad to meet you. The average price for a room is just under $100 per night. Note: There are no elevators here. Be prepared to walk just a few flights of stairs to get to the upper rooms and the rooftop.